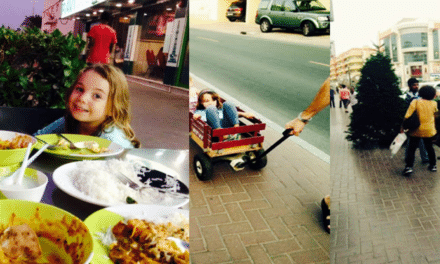 With love most definitely in the air this month, there’s plenty of choice for British mums when it comes to fantastic places in Dubai to spend your Valentines Day. 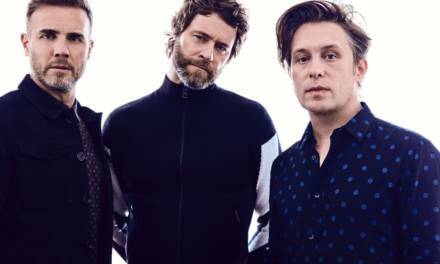 From romantic restaurants to some of the most picturesque spots in the city, here’s the top picks to see and be-seen this Valentines Day in Dubai. 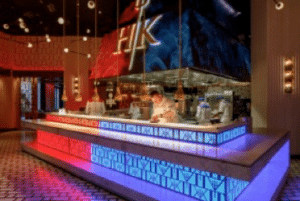 Gordon Ramsay is back – and this time he’s recreated HELL’s KITCHEN right here in Dubai at the spectacular new Caesars Palace Bluewaters Dubai. If you’ve been to Las Vegas, you’ll fall head over heels with this place – and if you haven’t been yet – go! 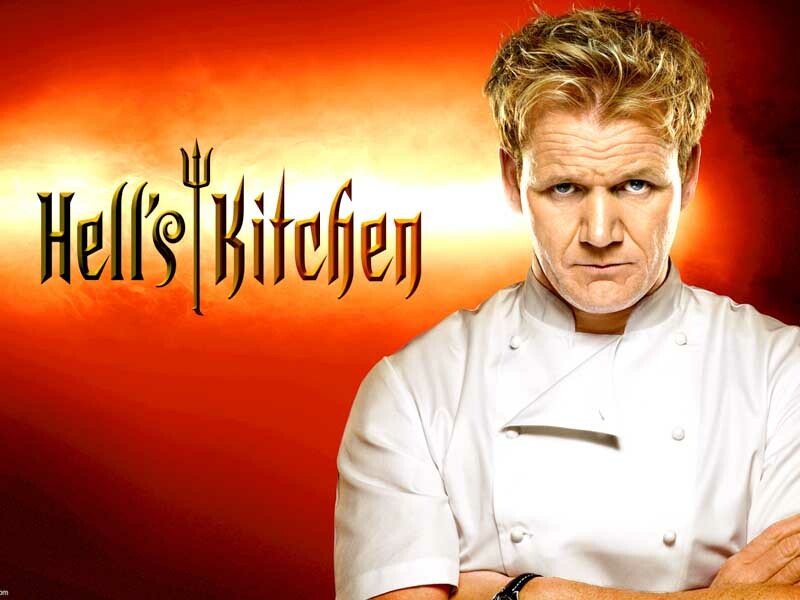 This Valentines Day HELL’s KITCHEN is giving couples Gordon Ramsay’s signature five course dinner set menu. The Valentine’s offer includes a glass of champagne, the finest of oysters and a selection of Gordon Ramsay’s flaming signature dishes such as Beef Wellington. What’s more you’ll indulge in a Valentine’s sharing dessert and complimentary chocolate truffle hearts for all the ladies attending and whilst it is a rather hefty AED 1,600 per couple, you’ll be blown away by the experience. 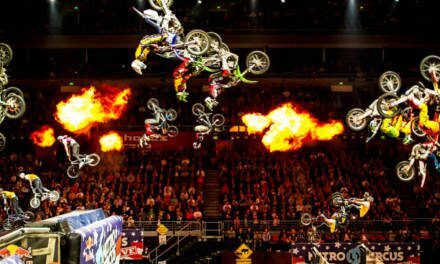 This is no ordinary cinema…. Oh no! You can make your Valentines date night as special as it gets at ‘The World’s Most Luxurious Cinema Experience’ at Reel Cinemas, in The Dubai Mall. 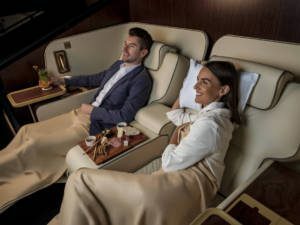 Expect to be pampered with upscale amenities like ultra soft blankets, personalised butler services, and never-before-seen super-luxurious seats that come with a private lounge and the chance to savour five-star gourmet food thats all been made fresh to order. Sit back drink in hand, watch the film of your choice, and have a valentines dinner in the best company. With prices starting at AED 168 per adult, this Valentines Day couldn’t be easier. Bookings can be made online, at the venue or on the Reel Cinemas app. 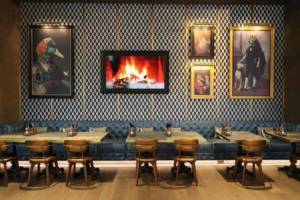 Roberto’s is one of Dubai’s best kept secrets when it comes to fine dining. Serving up delectable dishes that will make your mouth water, couples can enjoy an evening of romance at Roberto’s this Valentines day that comes complete with complimentary chocolate (now we’re talking) and a professionally taken photo for every couple set against the back drop of the Burj Khalifa. 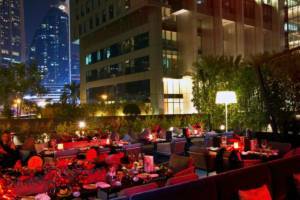 Set in their sophisticated restaurant that’s popular with Dubai’s banking bunch, diners can choose to be seated in the romantic outdoor space, or inside, and both will offer a truly memorable evening. You can dine Piemonte-style in the restaurant for AED 840 per couple with a delicious four course menu that includes Carpaccio Di Manzo e Tartare (Wagyu beef tartare and carpaccio with basil seed) and Filetto di Vitello burro, salvia, liquirizia (butter and sage veal tenderloin, baby courgetti and licorice). When: 14th February between 7pm and 11pm. There’s a lot of love being shown by Sheraton Dubai Creek Hotel & Towers this Valentines Day. From the Italian flavours created by Alberto Russo to British pub-style meals at The Chelsea Arms, there are some great offers on drinks and dining packages to suit a wide range of tastes. Creekside Japanese restaurant at Sheraton Dubai Creek & Towers will be hosting a night of romance and marvel as their supremely skilled chefs make some of the freshest sushi, sashimi and loads more Japanese specialities. 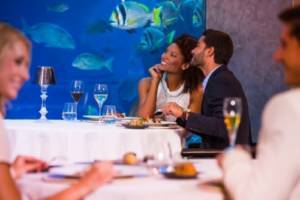 Their special Valentines Day dining package is a complete steal at the best of times and this Valentines day, for just AED 379 per couple you’ll be treated to a buffet inclusive of soft drinks or AED 499 including house drinks. 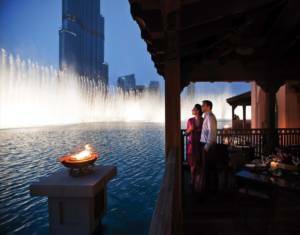 Thiptara, which means ‘Magic at the Water’ is aptly the name of Dubai’s most-loved Thai restaurant that’s surrounded by the Burj Lake. With spectacular views of The Dubai Fountain, Thiptara will be transforming this al fresco waterfront restaurant into one of the most magical settings you’re likely to find in Dubai. Couples visiting Thiptara at The Palace, Downtown can indulge in a five-course set menu with a love inspired table centerpiece arrangement and all guests attending will not only get one of the best views of Dubai Fountains, but they’ll also receive a special complimentary jar of Valentine’s special sweets. 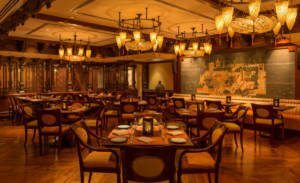 It’s AED 800 per couple inclusive of a five-course set menu, soft and house drinks, or AED 1370 per couple inclusive of a five-course set menu and a bottle of premium bubbly. If there’s one place that’s set for couples this Valentines day, it’s Ossiano at Atlantis The Palm, Dubai, where set against the mesmerising tranquility of the Ambassador Lagoon, this unique ‘under water’ restaurant not only serves up some of the finest seafood from the Gulf shores you’re ever likely to taste, but it’s also home to 65,000 marine species who will happily float on by as you’re feasting away. Created by award winning Chef de Cuisine, Grégoire Berger, this Valentines Day Bluedining experience costing AED 1,250 per couple, features a seven course set menu, a glass of Perrier Jouet Champagne and even blue seating to match. 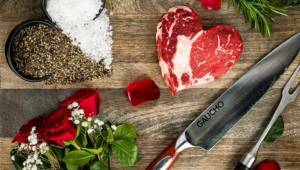 They say that the Argentinians don’t just have passion for their culture, food and wine, but they also a huge passion for people, and given that passion is on high on the agenda this Valentines Day, it’s no wonder that Gaucho, the famous DIFC restaurant with notoriously good steak, have curated a very special Valentine’s Day dinner menu. The special 3 course menu featuring fanciful starters like Truffle Lomo Carpaccio and Truffle Burrata, and mains including steak with lobster or foie gras, and saffron and coconut grilled scallops, will ensure you have a night to remember. You can finish off your candlelit evening with Dulce De Leche Cheesecake or Chocolate Truffles, and at the end of the evening, you’ll even receive a beautiful gift from Maison de Fleurs. 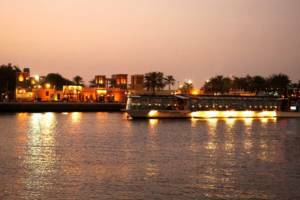 Book the babysitter as for something hopelessly romantic, you can embark on a moonlit cruise around a private marina on the signature Divaz boat in the JA The Resort in Jebel Ali. You’ll indulge in a sumptuous 5-course dinner menu featuring amazing mains such as Boston Lobster, Aged Filet Mignon or Black Cod, and you’ll get to share a bottle of grape between you too. Whilst enjoying live entertainment from an acoustic duo as you take in the sights, you can also make a night of it with an overnight stay complete with romantic turndown service, breakfast (even in bed), and a guaranteed complimentary room upgrade as well. If less of the romance and more of the fun is your thing this Valentines Day, then golf lovers, dog lovers and general fun-lovers should head on down to the Jumeirah Restaurant Group’s latest sporting country-style gastropub – The Duck Hook at Dubai Hills Golf Club where the venue’s daily happy hour will be in full swing between 3 and 8pm. Guests can quench their thirst with a bottle of house grape, or even a bottle of sparkling Italian bubbles and savour some Great British Gastro-pub favourites that you’d likely have back home. Flow, the contemporary health food restaurant and creative hub in Jumeirah Emirates Towers are putting a real spin on this Valentines Day by serving a limited (and very carefully-crafted) menu the whole of Valentines Week! Who said Valentine’s Day was only for couples? 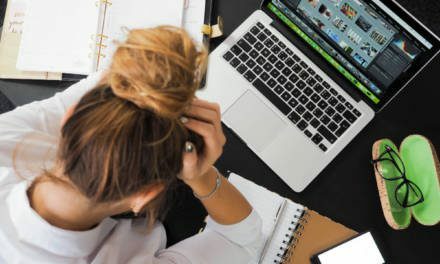 At Flow, you can show yourself the love you really deserve and continue 2019 as you meant to go on with heart-healthy dishes including Paleo favourites, Pan-Roasted Cobia Fish, Wholewheat Chocolate Zucchini Cake and a whole host of heathy delicious dishes that are nutrient rich and proven to reduce plaque in the arteries. With all these fabulous finds this Valentines Day, the only tricky thing left is deciding which to book. Happy Valentines Day ladies!